The secretary of state meets with the Japanese prime minister to firm up the two countries' positions on Pyongyang. TOKYO — America’s top diplomat left Tokyo for Pyongyang on Sunday after pledging that the U.S. will coordinate with allies Japan and South Korea on efforts to persuade North Korea to give up its nuclear weapons. 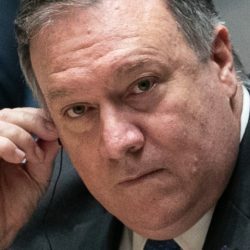 On the eve of his fourth visit to North Korea, Secretary of State Mike Pompeo met Saturday with Japanese Prime Minister Shinzo Abe to try to unify the countries’ positions as he looks to arrange a second summit between President Trump and North Korean leader Kim Jong Un and chart a path toward denuclearization. Pompeo also pledged that during his meeting with Kim on Sunday, he would raise the cases of Japanese citizens abducted by North Korea. Trump is pressing to meet with Kim for a second time after their June summit in Singapore produced a vague agreement on denuclearization with few, if any, specifics. Despite the historic meeting, the two sides are deadlocked over how to achieve that goal. Trump canceled Pompeo’s initial planned return to North Korea last month. In contrast with South Korea, where President Moon Jae-in has been at the forefront of encouraging Trump’s rapprochement with the North, Japan has been decidedly cautious, insisting its interests and concerns be addressed.